(Ottawa, Ont.) 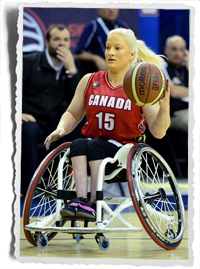 Wheelchair Basketball Canada would like to congratulate Senior Women’s National Team member, Melanie Hawtin, on being named the 2015 Burlington Sport Alliance Parasport Athlete of the Year. A dynamic athlete, this is the third time Hawtin has received this award, also being honoured in 2013 for wheelchair basketball and 2004 for wheelchair racing. This past year has seen Hawtin win gold with Team Canada at the 2014 World Championship, compete with the Burlington Vipers at the 2014 Canadian Wheelchair Basketball League National Championship and receive Wheelchair Basketball Canada’s True Sport Award. The Oakville, Ont. native aims to continue this success when she represents Canada at the Toronto 2015 Parapan American Games in August. Hawtin is currently in Winnipeg, centralizing with the Canadian team in preparation for Toronto 2015. The team is vying for a podium finish in order to qualify for the Rio 2016 Paralympic Games. Congratulations Mel!